I am doing an experiment for my science project. I am determining what effects potassium will have on the growth of garden spinach (potassium is used in halophytes so they can survive in saline soils), and to complete this experiments I will need to put these spinach seedlings in an environment that is salty, but not too salty so that they die. The problem is, is that I don't know the perfect level of salt and was wondering if you could help me. Comments for How much salt is too much? Hi Thea, this is one of those questions that's almost impossible to give an answer to. So much depends on the type of soil you're going to use, and also, the volume of it. I would do some testing before you get started. 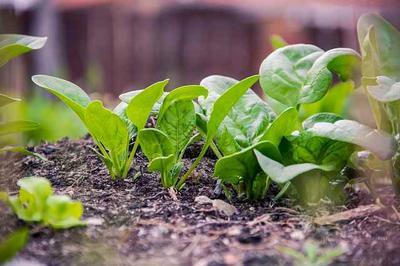 Spinach seeds are cheap, so get a package, and some of the same soil you're planning on using for the experiment. Measure the soil into pots that are all the same size, to give you a good baseline. I would mix some salt into warm water and measure that out too - starting with one pot, give it a measured amount of the salty water, and each pot, increase the amount. To make sure you don't just water log the soil, measure out the salty water into some clear water so they all get the same amount of moisture. I would start with something like a tablespoon of salt to a cup of warm water, mix that to disperse the salt, and then put one tablespoon of the salty water into a cup measure, add water to make one cup. Then the second pot, double it and so on. Five pots should give you enough to determine the right level. Stick five or six seeds in each pot, and put them all in the same place, temperature and light should all be the same. Keep records of it all! Good luck with it. Thanks you so much Jacki!! !